This was part of the manor of Tooting Graveney and the manor house stood near here. Peter Drouet’s pauper children’s asylum faced the Broadway in the mid-19th century. Set in seven acres of grounds it was a sizeable and profitable operation for Drouet until disgraceful sanitary condi­tions contributed to an outbreak of cholera in 1849 in which 118 children died. Drouet was put on trial for felonious killing but found not guilty. He sold up soon after­wards and the tragic episode prompted major municipal improve­ments to the area’s drainage. At the end of the 19th century there were still a few private houses inter­spersed among the shops on the Broadway. Trams began to serve Tooting Corner in 1903, frequently derailing on the sharp turn. A statue of Edward VII attired as commander-in-chief was erected on the corner in 1911. That year marked the completion the LCC’s Totterdown estate and the influx of new residents prompted a trans­form­ation in the scale of the shopping facil­ities. Tooting Broadway station opened in 1926. 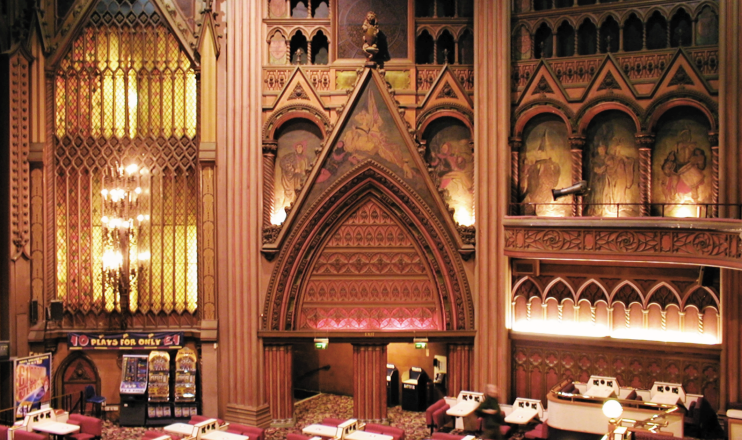 The Granada cinema of 1931 (now a bingo hall, shown in the photo above and marked with a big pink pin on the map below) has the most magni­ficent interior of its kind in London, a cathedral-like design modelled on the most lavish American picture palaces of the era. It was the first British cinema to be grade I listed. The independent shops and stalls of Broadway market and the nearby streets reflect the neighbourhood’s wide ethnic diversity. Tamil, Konkani/​Konkoui, Ibo/​Igbo, Tagalog and Creole French are among the most common languages spoken at St Boniface primary school on Undine Street. The nearby Salvador estate is named after a wealthy Tooting family who played a leading role in the estab­lishment of the first Jewish settlement in America. ‘On Tooting Broadway Station’ is a heart-rending outpouring of melancholic rage by local band Kitchens of Distinction. It’s on their albums The Death of Cool (1992) and Capsule: The Best of KOD (2003).